CollabTec: How Important Is HD to Desktop Business Video Conferences? How Important Is HD to Desktop Business Video Conferences? 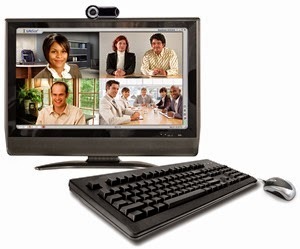 Desktop video conferencing has rapidly become a vital tool for businesses around the world. By reducing the need for travel, desktop video conferencing software offers a time-saving and cost-saving solution that allows businesses to connect with clients and partners from around the world. Additionally, it offers an opportunity to communicate in a more personal manner, while enhancing internal communication. While there is no doubt that desktop video conferencing offers a number of important benefits, you might wonder whether it makes a difference if your desktop video conferencing is broadcast in HD. Meeting a client face-to-face is an excellent way to form a long-term relationship and build the foundation for resolving any work issues. HD Desktop Video conferencing offers a high quality image and sound solution, ensuring that your video conferenced client meetings will feel as though you are actually in the same room with your clients. In this case, the difference between HD and SD is the difference between being able to communicate only adequately and being able to communicate in a way that generates long-term relationships between your business and your clients. Corporate training is among the most useful methods for utilizing desktop video conferencing. With that said, if the screen does not provide perfect image and video quality, it becomes difficult for employees to learn in an effective manner. With HD desktop video conferencing, every employee you train will be able to see every element of their training, ensuring they are able to perform work tasks to the best of their ability. Internal meetings are an integral part of every business, regardless of industry, because they offer a productive method for resolving business problems while providing a vehicle for steering campaigns in the right direction. Meetings facilitate improved working relationships because they provide immersive experiences. If SD desktop video conferencing is utilized for a meeting and there happens to be an image distortion or the sound quality is only average, it is impossible to replicate the immersive experience of an in-person meeting. HD desktop video conferencing provides a true in-the-room feeling for meetings, ensuring that business issues can be resolved and employees are able to be more productive. If you would like to improve the desktop video conferencing experience in your workplace dramatically, R-HUB desktop video conferencing can deliver the sharpest image quality and the clearest audio possible. Regardless of the industry or sector in which your business is involved, R-HUB can provide you with a video conferencing solution that will significantly improve your internal and external communication. Call us today at +44 (0)1925 659523 or email us at rhub@collaboration-technologies.co.uk to begin your free demo. We are confident that you will be amazed by the power of R-HUB desktop video conferencing in HD. How Can Remote Monitoring Improve your Business?